Apparently, Microsoft is going to change the way that they release updates for their various products; instead of bundling several fixes in a single package, in many cases it will be left up to users to find and install fixes individually. A service pack contains a number of patches, fixes and improvements for the software it has been released for. 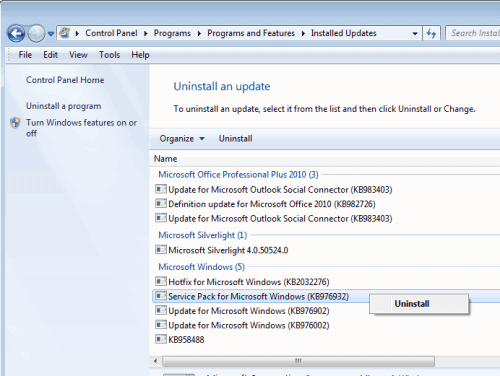 Microsoft up until now released service packs for many of its popular products including the Windows client and server operating system and Office. The service packs usually consists of patches that have already been available in one form or the other, with notable exceptions that are then released together with the service pack. It is not uncommon for companies to wait for the release of the first service pack for a new Microsoft product before it started migrating of systems to a new version of a software product. One of the reasons for this practice is that it usually takes less time to test and deploy a service pack, which basically is a single software product, than the testing and deployment of dozens of smaller updates. We know that Microsoft decided to do away with service pack for Windows 8 to concentrate on smaller updates and patches instead. Users may actually benefit from this as updates may be available sooner. This is for instance the case for the recently released Windows 8 performance and reliability update which improves a variety of systems and features including battery performance, audio and video playback or driver compatibility. According to news published by The Register, Microsoft won’t release a second service pack for Windows 7 either. This does not mean that there won’t be any updates anymore for the operating system, only that updates will be made available via Windows Update and Microsoft Download Center when they are released, and no longer as part of a service pack. Depending on the priority of the updates, it may mean that some updates slip past the user if they are not automatically installed by the operating system if Windows Update is used to update the operating system. Windows users who download the updates from Microsoft manually, for instance to deploy them on several systems without having to download them multiple times, may also run into the same issue as it may happen that a patch gets overlooked on the download site. Third party solutions that download all available patches for a particular system can be an option in this case to avoid this from happening. It needs to be noted that Microsoft has not commented yet on the news, so that it is still in the realm of possibility that we will see a second service pack for Windows 7 after all. What’s your take on this? Service packs yay or nay? This entry was posted on Wednesday, October 24th, 2012 at 9:39 am	and is filed under General News. You can follow any responses to this entry through the RSS 2.0 feed. Both comments and pings are currently closed.